All you desire is having a 500 followers giveaway: she's giving a whole bunch of polishes and nail treatmens, so head over to her great blog here. 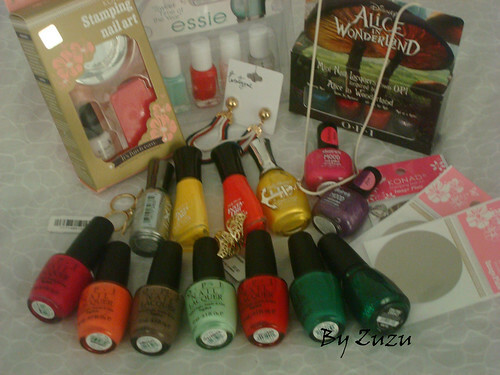 There's a lot of beauties at Emerald Sparkles 200+ followers giveaway, check it out here. Here's the link to insideofmypurse. Oh did I mention I like her swatches& the colours she picks out for her NOTD's? Well, now I did :). There's another awesome giveaway at Toxix Lipstick. She's giving away some Aussie polishes and they look gorgoeus. Here's the link. Chromatic Misadventventures is having an giveaway too- one of the prices are the Maybelline Flakie Topcoats :D- Check it out here . Schön eine Nail-Begeisterte auch aus Österreich zu treffen.